I used to work for a conservation NGO, and there I learned to further appreciate the importance of preserving the rich biodiversity we have. I also learned how interconnected and sometimes at odds economic development is with conservation development. While practitioners in each are working more closely together now, there is still much work to be done in really collaborating with a shared vision. Cocoa farming is an excellent example to illustrate this conflicted relationship. On one hand you have your cocoa farmers, who are concerned with getting a regular income and putting food on the table for their family. Then you have acres of rainforest that are being clear-cut, slash and burn style, to make room on large plantations for more monoculture crops. Why? Because demand is through the roof, and when faced with increased demands, the forests tend to lose, and human livelihoods tend to win. This does not have to be an either-or relationship! Conservation of trees and wildlife and sustenance of livelihoods can creatively come together and thrive. I encourage you to check out the link above to learn about the potential impacts of such partnerships. It makes so much sense to work with farmers to give them the tools that can enable them to become stewards of their land. Especially in the cocoa industry because the cacao tree is a crop that can grow and thrive in absolute harmony with other native species. The development of shade-grown cocoa can not only preserve the forests, it can improve livelihoods. This should be a mandated practice and it is my hope and dream that all the large industries adopt this awareness and contribute to a more conscious-laden industry. It is in their best interest to work with the farmers to preserve their forests to ensure a sustained and quality supply of the world’s dreamiest treat. This is where you, the consumer comes in. Demand quality. Demand to know what your beans were sprayed with. Demand full-cycle knowledge and transparency so you can trace your bar back to the farmer and the tree. If you need another push, check out this ode to shade-grown cacao as a powerful way to preserve wildlife. With RA certification, you know that the cacao in your bar was shade-grown. It was grown alongside other fruit trees, in the forest’s natural habitat. I applaud RA for providing the necessary training to farmers. They are empowering farmers to become more invested in the cacao tree. They are making it possible for the farmers to become more efficient and knowledgeable so they can increase their yield and the quality of their beans. 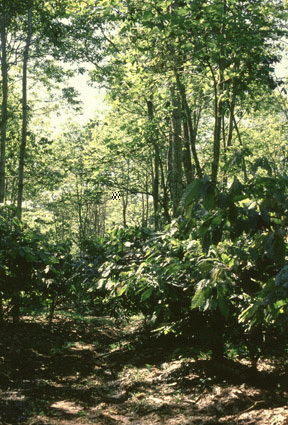 Shade-grown cacao is generally of this higher quality. So the farmer ends up getting paid more for their higher quality yields, while preserving their natural environment, improving their health (no pesticides), and contributing to symbiotic relations between the human and the tree. There is enough deforestation occurring on a global scale already, and to cut down more habitat to grow a crop that actually grows better and tastes better if grown within a diverse habitat is just plain ridiculous.